Thank you for your interest in Rockwood Dry Cleaners! If you are not already a customer we hope to meet you soon in one of our stores, or at your front porch! 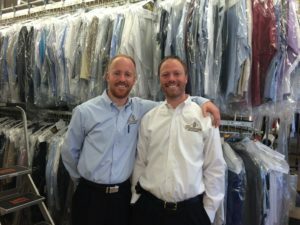 We know dry cleaning is a very competitive business and we realize you have many options. We hope you will give us the opportunity to show you we care about the quality of our work and that you are important to us as a customer. If we can answer any questions for you about our services or about garment care in general, please do not hesitate to call. We are a full-service dry cleaner that provides top quality dry cleaning, alterations, laundry, wedding gown cleaning and preservation, shoe shine and repair, and much more! Feel free to browse through our site to get a full understanding of everything we offer. We clean all garments onsite at our state of the art facility located in old downtown Gahanna. The best part is you don’t have to come to us! We come to you with our free pick-up and delivery dry cleaning and laundry straight to your home or office. We look forward to getting to know you!